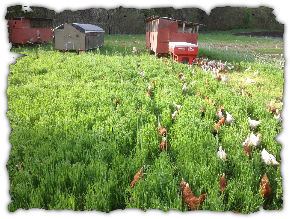 in 2003 we began our first small flock of hens...these days we have hundreds of beautiful free-ranging hens which live on lush green pasture in the Spring, Summer, and Fall and provide us (and you!) with wonderful fresh and very tasty eggs. Our birds enjoy all the freedoms a chicken should have. They live a stress-free life, living on their own terms with plenty of space and pasture to roam, graze, nap, and scratch. During the harsh New England winter the birds live in a large greenhouse where they enjoy the warmer temperatures and clean sunshine. Our hens live in a large mobile coop (the "henmobile") on a farm wagon which is moved around the field on a weekly basis allowing the birds consistent access to fresh grass. Just as with our meat birds, the chickens are fed a diet of vegetarian grains from Green Mountain Feeds - a certified organic feed company located in Vermont. Occasionally we feed the birds alfalfa, kelp for minerals, oyster shells for hard egg shells, and grit (granite bits) to assist their digestion. During winter we also feed them alfalfa and greens to help the egg yolk maintain is nice orange color. The mobile coops are a weather tight home for the birds. The eggs are laid inside a specially designed coop with dozens of specially designed nest boxes. The eggs are collected every day and cleaned if necessary. An automatic chicken door opener/closer lets the birds into the nesting coop in the mornings and closes in the evening. Where can I buy these tasty eggs? Our eggs can be purchased from the self-serve in the barn at Codman Community Farm in Lincoln and can also be found at Debra's Natural Gourmet in West Concord. 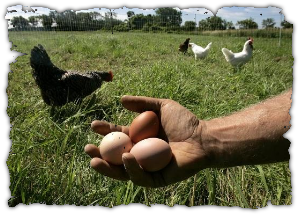 During the Summer months our eggs can also be found at Hutchins Farm, Barrett's Mill Farm and Walden Woods Farm. A carton of eggs contains a mixture of sizes and colors, ranging from light brown to dark chocolate brown eggs. While each carton contains a mixture of sizes, the total weight always equals at least what a normal "large" carton would weigh. The eggs are beautiful inside and out and will no doubt be the best you've ever tasted. 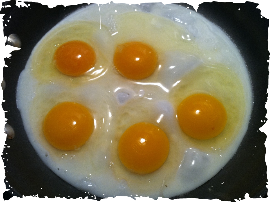 Eggs are $8.00 /Jumbos, $7.50 / dozen, $3.75 / half-dozen direct from us. For a short time in spring, we sell pullet eggs from our newly laying (young) hens (their first eggs until they size up) for $5.00/dozen.